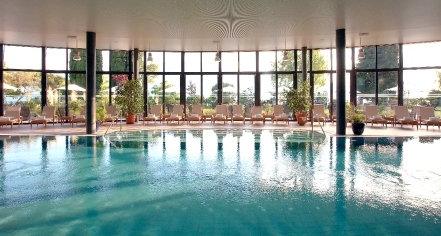 The Willow Stream Spa at Fairmont Le Montreux Palace is a unique oasis in one of the world’s most beautiful places. Treating guests to an authentic spa experience inspired by local traditions, plants, and herbs, creates a delightful, serene atmosphere for pampering. Over 2,000 square feet are dedicated to the wellbeing of guests at the palace. The attentive staff at Willow Stream Spa provides specialized signature treatments to visitors like eucalyptus salt scrubs, chamomile body polish, custom cleanse facials, and deep-tissue, strong-pressure massages. Options are also available for couples, men, and children. The spa use products from luxury brands Niance, Kerstin Florial International, and Universal Cream. Guests leave the Willow Stream Spa with soft supple skin, feeling regenerated, and rejuvenated. 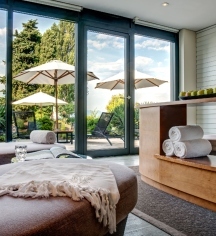 In addition to the spa, Fairmont Le Montreux has a fitness center where guests can take various classes or work out on their own. Classes target various needs, such as musculature, cardiovascular, relaxation, and athletic purposes. Collective classes include yoga, Pilates, body barre, Zumba, and aqua aerobics. Personal training is also available.